With Dope, Writer-Director Rick Famuyiwa introduces a likable young cast of characters, but is the movie he crafts around them actually dope or just dopey? The story follows Malcom (Shameik Moore), a bright high school senior in Inglewood, California. Malcom, along with his friends Jib (Tony Revolori) and Diggy (Kiersey Clemons), is a geek with the focus of his geekdom being 1990s hip hop music and culture. He, Jib, and Diggy have a punk band and all of them are looking to get into good schools for college. Malcom wants to go to Harvard. However, as is the case in rough neighborhoods like Malcom’s, drugs and gangs are a constant threat. By chance, Malcom comes across local drug dealer Dom (A$ap Rocky) and ends up doing a small favor for him. He is then invited to Dom’s birthday party. While there, Malcom tries to win the favor of a local girl, Nakia (Zoë Kravitz). They make a connection, but Dom is interested too. The party gets raided by a rival gang first and then the police. Malcom and Nakia escape, but he discovers that Dom has been arrested and stashed a large quantity of drugs and a pistol in Malcom’s ever-present backpack. The drugs and how to get rid of them set Malcom and his friends on a wild adventure that has a lot of funny moments, but also some serious ones as well. This clashing of comedy and drama is the biggest problem with Dope. Malcom is in a serious situation. Everyone he knows could be in grave danger if he isn’t careful. But several of the characters he encounters do not reflect the gravity of the situation. Two guys who are trying to get their hands on the drugs feel like they came right out of Ice Cube’s Friday, which is a straight up comedy. Then, when Malcom encounters Austin Jacoby (Roger Guenveur Smith), the alumnus who can help him get into Harvard, his character is so self-serious, he almost borders on parody. Nothing really jells right once the drugs are introduced into the story. Also, Malcom’s handling of the drug situation smacks of Risky Business, Girl Next Door, and the like. So essentially, these very original three leads are ultimately dropped into a rehash movie, which was disappointing. Moore, Revolori, and Clemons are really great here and the main reason to see the film. I actually wanted the film to focus more on their geek status, but that eventually takes a backseat to all the drug stuff. Kravitz is good as the “older woman” in Malcom’s life, but her role is strange in that she disappears for a large chunk of the film. Blake Anderson puts in a funny appearance later in the film, but this one is all about the performance and chemistry of the three leads. 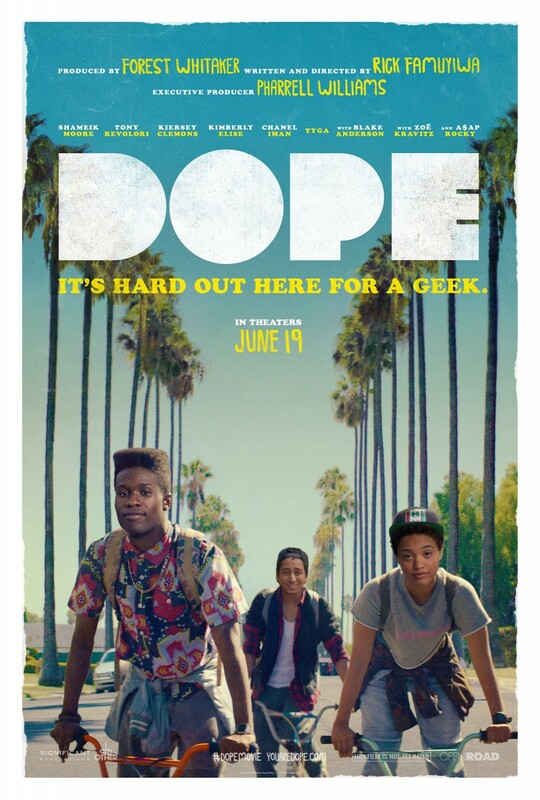 Overall, I enjoyed Dope, but it wasn’t the film I was expecting. Sometimes that can work out great, but in this instance, the mixing of comedy and drama hurts the film more than it helps. This entry was posted in Reviews and tagged 2015, Blake Anderson, comedy, Dope, Film Reviews, Films, Hodgepodge, Kiersey Clemons, Movie Reviews, Movies, Podcast, Rick Famuyiwa, Risky Business, Shameik Moore, Tony Revolori, Zoe Kravitz. Bookmark the permalink.